Edge computing is evolving from a relatively obscure concept into an increasingly complex component of a distributed computing architecture, in which processing is being shifted toward end devices and satellite data facilities and away from the cloud. Edge computing has gained attention in two main areas. One is the industrial IoT, where it serves as a do-it-yourself infrastructure for on-site data centers. The second involves autonomous vehicles, where there is simply not enough time to ask the cloud for solutions. But ask two people to describe it and you are likely to get two very different answers. On one hand, it is understood well enough that it can be used in satellite IIoT data centers and in machine learning-enabled iPhones. On the other, most of those designing it can’t say what it looks like. Much of the confusion stems from the fact that edge computing is not a technology. It’s more of a technological coping mechanism. It represents a series of efforts to deal with the exponential growth of data from billions of endpoint devices by digesting at least some of that data wherever it is created. That requires building massive compute performance into everything from sensors to smart phones, and all of this has to happen within an even tighter power budget. This approach stands in stark contrast to the general consensus several years ago that simple sensors would be used to collect data from the physical world and processed in the cloud. The original concept failed to take into account that the amount of data being collected by sensors is growing too large to move around quickly. The best solution is to pre-process that data, because most of it is useless. This is the growing responsibility of edge devices. But how the edge evolves, and how quickly, depends upon the readiness of end markets that will drive it. So while the edge began taking off last year in the IIoT, it is still on hold in the automotive space because it’s not clear at this point how quickly fully autonomous vehicles will begin to ramp up. 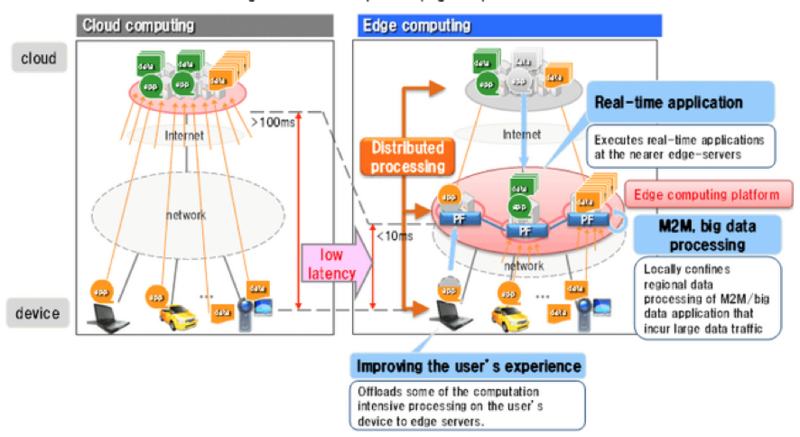 Many chipmakers and systems companies struggle with the variety of ways it is possible to shift computing to the edge. There are no demarcation lines between the many levels that may or may not be included in this distributed computing model. It doesn’t help that there are varied language and explanations offered by carriers, networking providers, integrators, datacenter OEMs and cloud providers—all of which are competing for what might be billions of dollars in additional sales in a market described by a term that doesn’t mean anything specific enough to package under a single brand name, according to Tom Hackenberg, principal analyst for embedded systems at IHSMarkit. “Edge computing” is a common but non-specific term referring to the addition of computing resources anywhere close to the endpoint of an IT infrastructure. The definition has been narrowed colloquially to mean compute resources installed specifically to support IoT installations. “It’s a set of architectural strategies, not a product, not a technology,” Hackenberg said. Still, there are benefits to getting this right. Gopal Rahgavan, CEO of startup Eta Compute, said that edge computing improves both privacy and security because it keeps data local. And it improves response time by eliminating the time it takes to send and receive data back from the cloud. “You want to sense, infer, and act without going to the cloud, but you also want the ability to learn on the edge,” he said, noting that the cochlea in the ear already does this today, allowing it to identify speech in a noisy environment. The same happens with the retina in the eye, which can decipher images and movement before the brain can process those images. One of the initial drivers behind the edge computing model was the industrial IoT, where a desire to see projects succeed prompted industrial organizations to try to solve both the cost-efficiency and data-deluge problems on their own. That, in turn, led to a push to keep compute resources near the physical plants. But the benefits go much deeper than just keeping IoT devices off the Internet, according to Rambus’ Woo. More processing power means greater ability to pre-process data to eliminate repetitions of the same temperature reading, for example, or render the data feed from hundreds of sensors as a single status report. Apple’s announcement in 2017 that it would put machine learning accelerators into its top-end iPhone touched off a rush that Gartner predicts will see 80% of smartphones will be AI-equipped by 2022. Those will be powerful, latency-sensitive edge devices, but will focus on functions aimed at individual consumers – augmented reality and biometric authentication, for example, which will limit their impact in the short term, said IDC’s Rau. The addition of ML capabilities into other consumer devices – and autonomous vehicles and other smart devices – is likely to create an ecosystem on which all kinds of powerful applications can be built, using edge data centers for support, said Mohandass. Much of the edge model is based on the way the human body processes information. A person’s hand will recoil from a hot stove, for example, before signals reach the brain. The brain then can explain what just happened and avoid such situations in the future. Regardless of the moniker, edge computing appears to be icing on the cake for technology providers. For one thing, it won’t cannibalize public cloud spending. IDC predicts a 23% increase this year compared to last, and 21.9% annual growth until 2021. And it could only be helping sales of the IoT, a market in which IDC predicts spending will rise 15% in 2018 compared to 2017, to a total of $772 billion, $239 billion of which will go to modules, sensors, infrastructure and security. IoT will see annual growth of 14% per year and pass the $1 trillion mark in 2020, according to IDC. Gartner predicts semiconductor revenue will rise 7.5% to $451 billion in 2018, far above the record $411 billion in 2017. And by 2021 51% of all devices connecting to the Internet will be IoT. Their chatter will rise from 2% of all global IP traffic during 2016 to 5% of all IP traffic, according to Cisco Systems (Cisco VNI Global IP Traffic Forecast). Humans will interact with those devices an average of 4,800 times per day in 2025, helping to drive the volume of digital data created every year up by a factor of 10, from 16.1 zettabytes in 2016 to 163 zettabytes during 2025, according to IDC’s August, 2017 report Data Age 2025. While reports from IDC and IHSMarkit show the cloud market continuing to grow, they have trouble showing the increasing dominance of edge computing, which may not exist in a formal sense. Moreover, it is difficult to define well enough for those who design the intelligence to make it happen. Not surprisingly, there is some variability in what building blocks and configurations might work best as edge data centers. Edge data centers have to be more flexible and more focused on immediate response than traditional glass-house data centers. They also have to be able to combine many data streams into one usable base that can be acted upon quickly. From a hardware perspective, however, the edge can be anything from a collection of servers and storage units house using a co-location agreement in a local cloud or data processing facility, to a hyperconverged data center-infrastructure module housed in a cryogenically cooled shipping container. The scale of some IoT installations will force some organizations to build full-scale data centers even at the edge, or use a piece of one owned by a service provider, according Michael Howard, executive director of research and analysis for carrier networks at IHSMarkit. Some carriers are interested in accelerating converting the 17,000 or so telco wiring centers in almost every community in the U.S. to offer richer IT services, including edge services. Central Office Rearchitected as a Datacenter (CORD) programs have converted only a few facilities, however, and most will see more use in the conversion to 5G than in edge computing, Howard said. Other options include the smaller, more modular and more easily scalable products that make it easier to assemble resources to fit the size and function of the devices they support, Hackenberg said. That could mean hyper-converged datacenter solutions like Cisco’s UCS, or pre-packaged 3KVA to 8KVA DCIM-compliant Micro Data Centers from Schneider Electric, HPE and others. There also are VM-based self-contained server/application “cloudlets” described by Mahadev Satyanarayanan of Carnegie Mellon University, and the nascent Open Edge Computing consortium. The risk of breaches is growing, and so is the potential damage. As cloud services adoption soars, datacenter chip requirements are evolving.